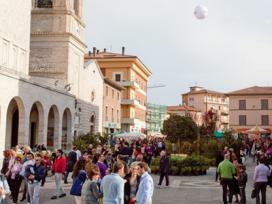 Bastia Umbra, which is situated in the plain dominated by Mount Subasio, is now an important economic center in the Assisi area. Bastia's vocation, in fact, is not of the touristic kind;from an artistic point of view, it is certainly inferior to other neighbouring cities. Even if the appearance of its residencial district is prevalently modern, the town center still contains fortifications and very ancient buildings. For example, in Piazza Mazzini you'll find the 14th church of the Holy Cross, which is distinguished by its white and red chalk facade typical of the Subasio region. The same materials were also used for many other buildings of the region, such as for the church of St. Chiara at Assisi. Close by, crowning a low hill, it is possible to visit the Castle St. Angelo, which, surrounded by medieval walls and towers, contains one of the oldest convents of the Francescan order.